Teachers play a crucial role in our society, but unfortunately, they're often taken for granted (hence the recent strikes in states like Oklahoma, West Virginia, Kentucky, and Arizona). Which is why it's so important for us to observe the one week set aside each year to appreciate the work they do. This year, many of our favorite restaurants are doing so by offering teachers special deals, discounts, and freebies. Today, Teacher Appreciation Day, and this week, Teacher Appreciation Week, teachers can eat for free at many chains around the country. Take a look ahead to find out where the deals are, and if you're a teacher, go out and treat yourself. You deserve it! All week long, Bruegger’s is offering 20% off catering. Additionally, treat a teacher to a $25 gift card, and you'll get a free egg sandwich of choice with the purchase. Today, teachers can take advantage of a special buy one get one free deal at Chipotle. Between 3 p.m. and close, a faculty school ID will get teachers, faculty, and staff a free burrito, bowl, salad, or order of tacos with the purchase of any one of the entrees. 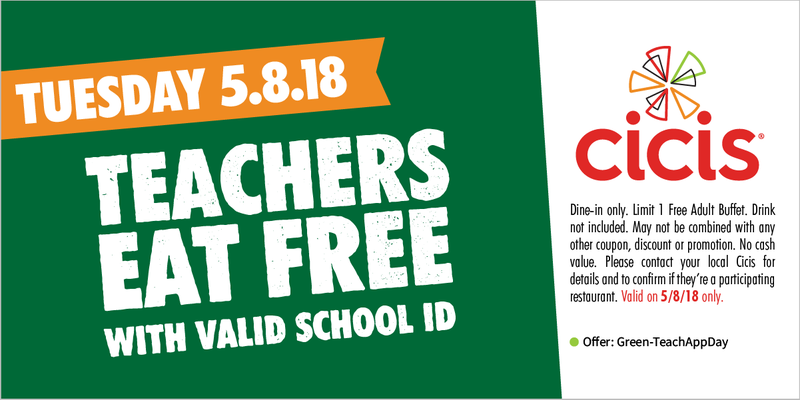 When teachers show a valid school ID along with this coupon, they can eat for free at Cicis pizza buffet. New York City-based fast-casual sister restaurants honeygrow and minigrow are thanking educators by offering $3 off of all orders placed after 3 p.m. today. Present a valid school ID to redeem the offer. All this week, teachers can get 20% off their orders at Metro Diner. In honor of Teacher Appreciation Day, MOD Pizza is offering 50% off a pizza or salad to anyone who shows a teacher's ID. PDQ is giving teachers 50% off their entire orders with a valid ID all day long. Teachers can enjoy a free fountain drink or cookie with the purchase of a sandwich or salad when they present their school ID. From 6 p.m. to 9 p.m. today, teachers and school faculty can get one free combo box with a valid ID. The offer is good for dine in and drive-through orders. Teachers who buy one salad or wrap at Salata today can get one free with ID. The deal covers one protein, and isn't valid on add-ons like avocado. Today, teachers are being treated to free shakes at Zinburger's east coast locations.